Sorry if this post is a bit obvious to some members but maybe it will help others in future. Background: Yesterday I was having trouble aligning the finder scope on my Apollo 60/910. I just could not get the crosshairs over the target. Today, with fresh eyes, I looked at the set up. I noticed that even when the finder scope attachment screw to the shoe was tight, there was still a tiny amount of play between the holder and the shoe. I stuck a small amount of aluminium tape at the end of the shoe's base to raise the hight of the end of the shoe's floor. There was no longer any play and sure enough now the crosshairs are lining up perfectly. As an aside, I unscrewed the finder scope shoe and was surprised to see how white the original colour of the scope was - got cleaning it straight away! Good that you got it fixed! So the finderscope ring holder has no set screws? The ring has the 3 normal screws. The problem was when the mount was screwed tightly into place, it was misaligned due to the aforementioned play in the shoe. When did finder scopes start having the two adjustable and one spring mounted screw system? It's a bit more user friendly! Your 60/910mm Apollo is a very nice airspaced achromat. It was sold by Quelle in Germany. You should get a very sharp and contrasty view of planets. Did you startest it? I haven't had the chance - has been extremely cloudy where I am in Germany. The weather is forecast to be clearer next week so will try the star test then. Thanks for the cleaning tip! Sorry, cleaning tip thanks should have been addressed to the previous poster. The seeing was good last night and I had the chance to star test. 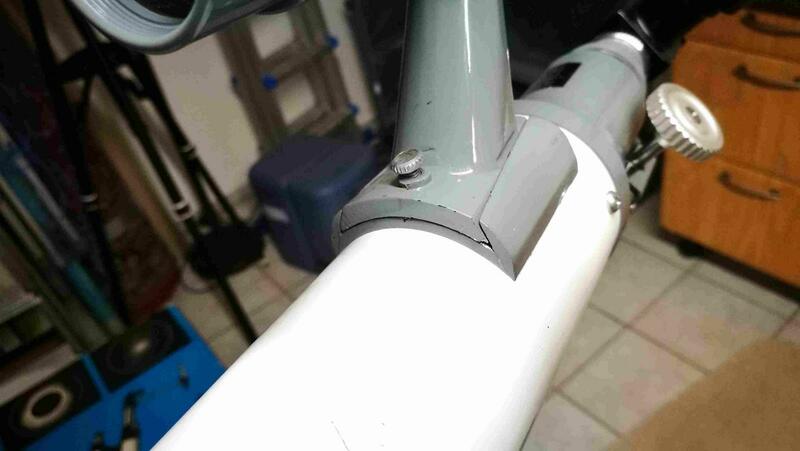 I was a little apprehensive because of the glue issue on the spacers I have spoken about on another thread. I am inexperienced on what is a 'good' result but I saw nice distinct concentric circles on Vega on both outside and inside point of focus. Stars were pinpoint sharp and contrast was noticeably more pronounced than my Skywatcher Mak 102. Pleiades were stunning. Moon sharp and full of detail. Really enjoyed the brief session.